In just a few weeks, Journey will be celebrating the most important event in our faith…Easter Sunday. It is the day that we celebrate the birth of our salvation through the resurrection of Jesus Christ. It was the culmination of Jesus’s ministry and calling in the world and, historically, it capped a number of important events in the life of the early church that was in it’s initial stages of birth. For hundreds of years, Christians have been compelled to not just show up, but to prepare their hearts for this high, holy day. Lent is a period of spiritual preparation that begins 46 days prior to Easter with Ash Wednesday and is usually accompanied with giving up some comfort or taking up some discipline to focus our minds and hearts on the gift that we have received through Christ on the cross. Easter will be the celebration at the height of this spiritual preparation. The 8 days leading up to Easter is called Holy Week. It begins on Palm Sunday and will end on Easter. During this week, millions of Christians will be celebrating in some very familiar ways. 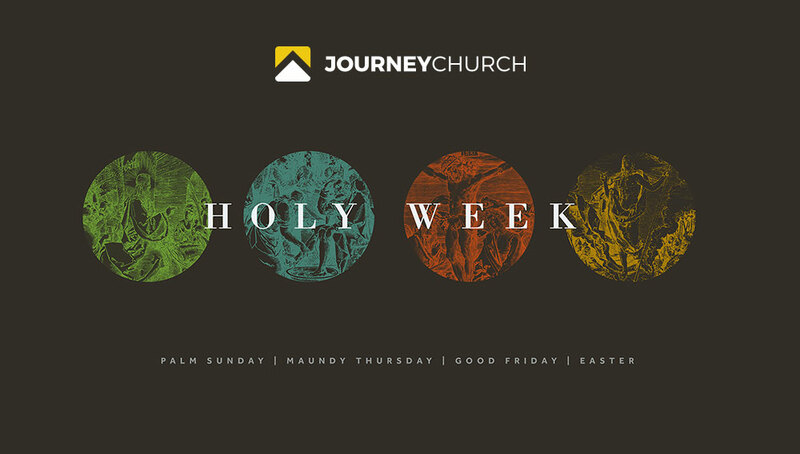 This year, Journey will be joining our brothers and sisters across the globe in celebrating 4 distinct events during this most holy week. 1. Palm Sunday – Palm Sunday happens the Sunday before Easter. It represents the triumphal entry of Jesus into Jerusalem. Crowds cheered for Jesus as He rode in on a donkey and they laid palm branches on the ground as a symbol for a king. We will be using palm leaves during our service in a special celebration that will be saved and used next year for our first Ash Wednesday service in accordance with the history and celebration of that holy day. 2. Maundy Thursday – The Thursday before Easter was a special time for the disciples. Jesus celebrated a very special passover meal with them and instructed them to continue it till He would return. It would no longer symbolize their deliverance from Egypt, but their eternal deliverance from sin. Maundy Thursday will be special evening service of communion and worship that you will not want to miss. It is a time of celebration as we prepare to remember the terrible events that would come the following day. 3. Good Friday – This year, we will be remembering Good Friday through a very special interactive, self-guided event through our facilities called “Stations of the Cross”. Throughout the building, different stations will be setup for you to guide yourself or your family and friends through engaging opportunities to remember the significance of Jesus’s death and the freedom that He was bringing us, just 3 days later. It will be a multi-sensory environment with sights, sounds, and smells meant to bring us to a deeper moment of worship as we prepare for the coming resurrection. Our facilities will be open during lunch and dinner for you to choose the best time to participate. 4. Easter Sunday – This is the big celebration! Our voices will join with all followers of Jesus in every corner of the world as we remember and give thangs for the gift of salvation through Jesus Christ. It will be the culmination of our spiritual preparation and I hope you will not only join us, but will bring someone with you. In the coming weeks, we will be sharing more about each of these events but it is my hope that you will join us for each one. Like most weeks, you will have many things reaching for your time. I want to encourage you to set these special times aside for your own preparation to fully experience Christ this Easter. Debby on Tattoos and T-Shirts. Choose love. Leslie on Did you do it, yet? Helen Adams on Will God give you more than you can handle?